Converting a Sears Kenmore into a "Kegmore"
Here's my old beer fridge, which you may remember from a previous post. I have begun to homebrew, therefore the refrigerator needed to come up to the next level, since I also chose to keg the beer instead of bottling. 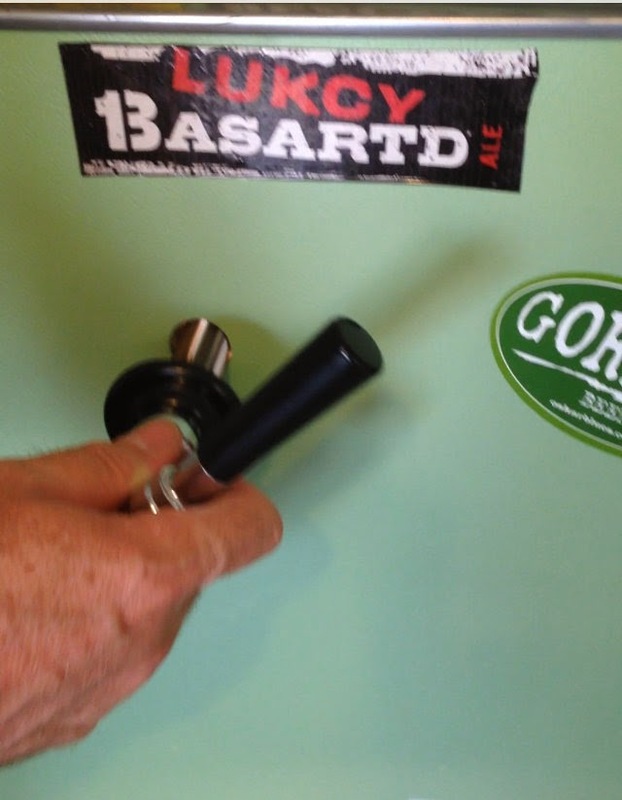 This system is setup for a ball lock style corny (Cornelius) keg, but you may get parts for your own pinlock or Sankey style connections. Below is a photo step-by-step on how the conversion was accomplished. there if you are on a budget. The drip tray was also available online and cost about $20. The CO2 tank, regulator w/gauges, hoses, clamps, shank, wrench, faucet and handle came as part of a complete package, from a different online web store. Shipping and handling were also free and the cost for the package was around $150. I did not have a 1" metal hole-saw, so add another $25 for a set of saws. If you, or someone you know, owns a 1" saw, you can save the $$$ for more beer! Lucky you. As mentioned before, I have the fridge and was willing to drill some holes. If you don't have a refrigerator, scour the local want-ads or Craigslist in your area. You should be able to pick up a decent working fridge for around $100 or less. Start by selecting a flat location with adequate access inside the fridge door. I had considered mounting the taps on one side of the fridge, but after placing my hand on the sides while the compressor was running, I discovered a few warm spots (to the touch) by running the palm of my hand along the outside skin of the unit. This indicates that some coils may be present as part of the defrosting or cooling system. Even if it is cool to the touch, there may be unseen wiring buried between the metal exterior and the plastic/insulation interior. Since the door has none of these issues with which to contend, it made the choice easy. I'd recommend the side closest to the hinge, if accessible, as this will keep the beer line hoses out of the way when the door is opened and closed. Safety glasses on, begin by drilling a 1/8" hole on the inside of the door, all the way through to the outside, remembering to keep the bit level. The outside hole will act as a pilot marker for the hole-saw. Switch over to the 1" hole-saw and repeat the process. Start by cutting a 1" hole into the plastic & insulation until the pilot bit "finds" the 1/8" pilot hole, then stop. 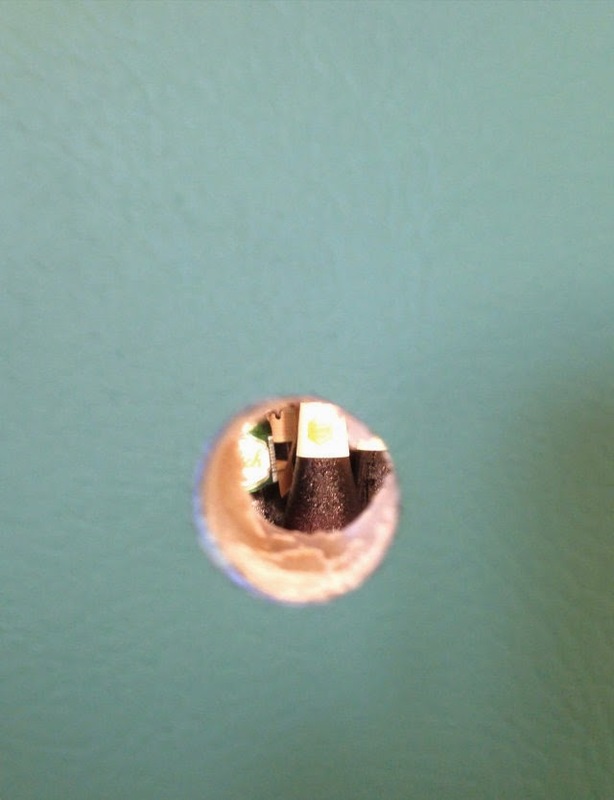 Remove the debris from the hole-saw, then place the pilot in the outside door hole and finish cutting the hole. Drill slowly and carefully each time. Take a round file and smooth out any of the burrs on the metal of the door. The shank/faucet can now be inserted through the door and the shank nut, tightened. Note: There is enough room in the utility door to add two more taps, right and left of this one. I planned the placement for that possibility. I had to pull out the two lower crisper bins and shelf to allow enough head space for the corny keg with the ball lock connectors attached. As you can see, there is still plenty of room in the door and on the adjustable shelves for beer or food. I like to keep a few chilled (never frozen) glasses in the door. Just place a rubberized drip shelf to allow them to stay clean and ventilated. Down the road, a board will be added to keep the CO2 tank and keg level in the bottom of the fridge. Center, mark and drill the holes for the drip tray. Be sure to check the height of the tray to the tap so you have clearance. Use your judgement for best positioning. Top Tip: Later, I will add a drain to my drip tray, attach some tubing, running the line back through the door and into an empty gallon jug. It will act as a runoff drain. I would place the jug in the lower part of the inside door. Great for party guests that have an occasional oops, without having to frequently sponge out the bottom of the tray.